Swagbuck’s UK- Earn an easy 50 SB with September’s Shop Swago! It’s September, which means it’s time for a new Shopping Swago! 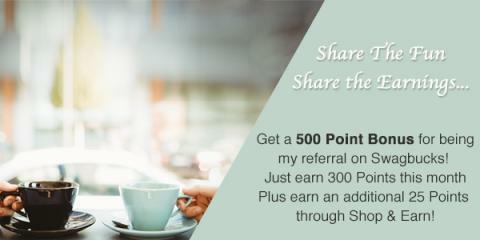 This is one of the simplest ways to earn some bonus SB, so well worth completing. Click here to join the board! The Shop Swago will begin on Monday September 24th at 5 PM BST (9 AM PT/12 PM ET). Make sure you hit “Join Now” on the board, otherwise you won’t get credit for completing the action items. Each square on your Swago Board will contain an action item to complete. The game ends Friday, September 28th at 8 PM BST (12 PM PT/3 PM ET). So make sure to hit “Submit” on the pattern you wish to submit. If you don’t hit “Submit” before the game ends you won’t receive your SB bonus. Please note: you may need both a mobile device and a desktop device to complete the board. Not a member of Swagbucks? It’s one of our preferred GPT sites – click on the image below to sign up now and be in with a chance of a 300SB bonus! Don’t know what Swago is? Confused about how you can complete the board? Click here to find out everything you need to know about Swago boards. Click here to see how to complete the Swag Button squares. Read our Top 10 Tips for completing the Swago board. « Earn up to 100 SB in the Swagbucks Music Mania Team Challenge!